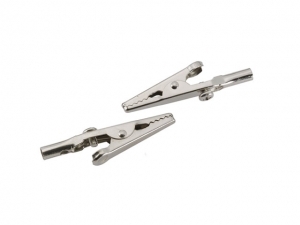 These alligator clips fit the end of any of our earthing leads. They are mainly used for clamping the lead onto metal seat frames for static discharge while travelling in a car, or aeroplane. They can also help to clamp a lead to a metal water pipe for earthing, where indoor wall sockets are not earthed. You can read more about this in our article Earthing for Travelling. Includes two alligator clips. You are living in a home that is not correctly earthed (uncommon in Australia). This earthing adapter is for use in UK, Hong Kong, Malaysia and Singapore and other countries that use a Type G earthed powerpoints. This includes Bahrain, Bangladesh, Botswana, Brunei, Cyprus, Ghana, Gibraltar, Iraq, Ireland, Jordan, Kenya, Kuwait, Macau, Malawi, Malta, Mauritius, Nigeria, Oman, Pakistan, Qatar, Sri Lanka, Tanzania, UAE, Uganda, Yemen, Zambia and Zimbabwe. See a full list of countries that use Type G powerpoints here. Note some of these countries may have other types of sockets which are not earthed. 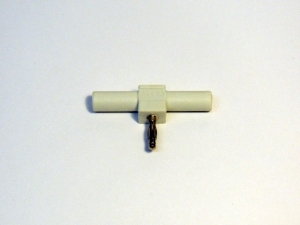 Better Earthing adapters are custom-made and have a built-in 10,000 Ohm safety resistor suited for earthing (in addition to the safety resistor that is fitted inside of our Better Earthing leads). They have three inputs for earthing so you can connect up to three products or two products and a multimeter. Use this handy 10m straight extension lead to add extra length to our standard 5m straight or 6m coiled earthing leads. This is handy if you only have one powerpoint in a room, as you can run the 10m extension lead along the edge of the room until you have the connection point right where you need it. If you are looking for an outdoor extension lead, please see our grounding rod kits which include 15metre UV resistant outdoor leads. All Better Earthing leads are custom made for additional durability and reliability, in line with our 2-Year warranty. 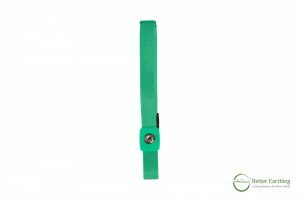 This large 55 cm earthing band is suited for use around your thigh, upper arm and knee joint. It can be used individually or in combination with other earthing products to accelerate healing and speed recovery to an injured area. Place on bare skin. 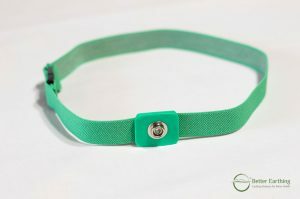 The inside of the band has stainless steel fibre and the metal plate. When they gently touch your skin, they bring the earth’s free electrons to you. This band can be machine washed with any detergent. Please note you also need a Better Earthing lead and Adapter to connect this band to the earth. 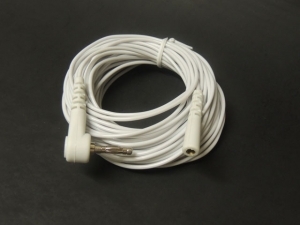 These are included (along with the band) in our single or double Earthing Band Kits. 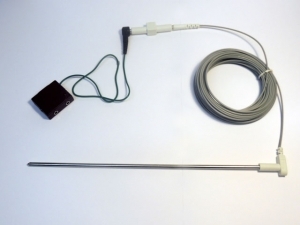 This two-way splitter allows you to connect two earthing products (or a product and a multimeter) to your grounding rod and lead. 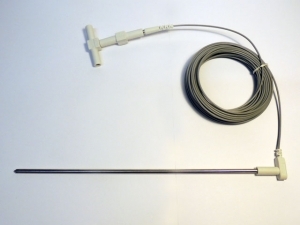 If you want to use more products consider our 4 input splitter box for grounding rod. Note, Better Earthing Adapter already comes with two inputs built-in. 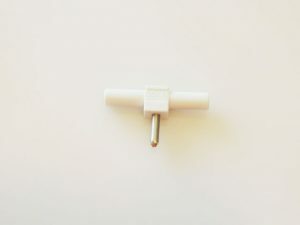 This powerpoint tester and adapter are for use with Type B earthed powerpoints in USA, Canada, Japan, Philippines, Taiwan, Thailand, USA and other countries with a type B powerpoints. For surety, we recommend that you test your powerpoint is correctly earthed before using your earthing product in some of the above countries. Plug the tester in and watch for the pattern in the lights (the centre and right lights come on when wired correctly). Then plug your adapter directly into the lower round 3rd earth port. 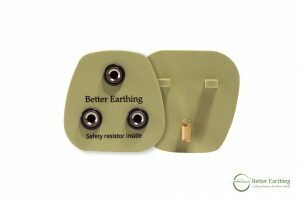 Better Earthing adapters are custom-made and have a built-in 10,000 Ohm safety resistor suited for earthing (in addition to the safety resistor that is fitted inside of our Better Earthing leads). 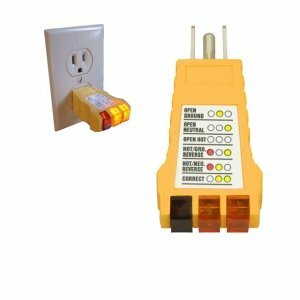 This adapter can be used to connect two products or one product and a testing multimeter. This earthing adapter is for use in most of Europe, Indonesia and other countries that use a Type F earthed powerpoints. This includes in Austria, Belgium, Bulgaria, Chile, Croatia, Czech Republic, Estonia, Finland, France, Germany, Greece, Hungary, Iceland, Italy ('Schuko' type sockets), Latvia, Lithuania, Luxembourg, Netherlands, Norway, Pakistan, Poland, Portugal, Romania, Russia, Serbia, Slovakia, Slovenia, South Korea, Spain, (Sweden, should NOT earth to wall sockets), Turkey and Uruguay. See a full list of countries that use Type F powerpoints here. Note some of these countries may have other types of sockets which are not earthed. 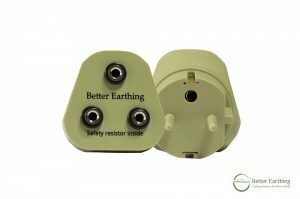 Better Earthing adapters are custom-made and have a built-in 10,000 Ohm safety resistor suited for earthing (in addition to the safety resistor that is fitted inside of our Better Earthing leads). They have three inputs for earthing so you can connect up to three products or two products and a multimeter.